During the third week of October, Bird-X account managers flocked to Seattle, Washington for PestWorld 2016; a four-day tradeshow put on by the National Pest Management Association (NPMA). PestWorld is an all-encompassing tradeshow, putting new information and products into the hands of everyone within the Pest Control community. PestWorld gives participants the opportunity to learn about advancements in the industry with informative discussions and the demonstration of new products. 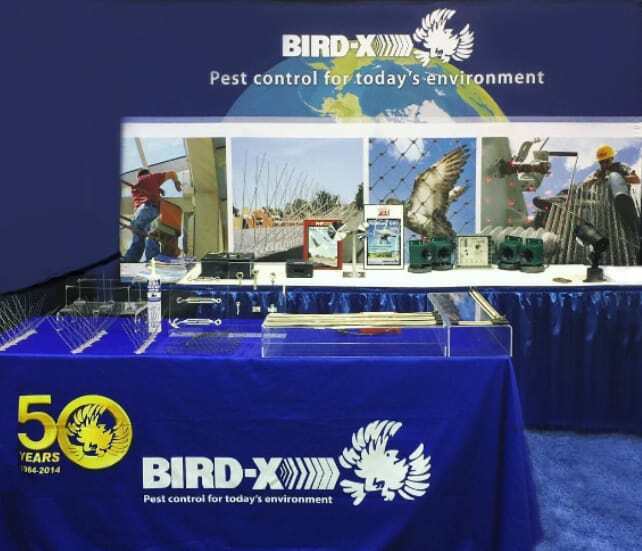 “PestWorld, as always, was an amazing experience for Bird-X. It was a great opportunity for us to meet many of our current clients, as well as introduce ourselves to new international and domestic partners,” says Josh Pierce, Bird-X Sales Manager. PestWorld provides an ample amount of time to exhibit products while still having plenty of opportunities to interact with current customers and prospects outside of show hours. The presentation that resonates with Tim Coughlin, Account Manager, is Heath Waldorf’s “Talking Turkey” presentation. Waldorf, of the Bird Control Advisory, breaks down urban bird control and explains that it consists of so much more than just bird spikes. “The ‘Talking Turkey’ presentation is a benchmark for pest control operators to fully understand the structural bird control world.” remarks Coughlin. Presentations like Waldorf’s are exactly why PestWorld is such a pivotal tradeshow – it is engaging, hands-on, innovative, and a fantastic networking event. Every minute is utilized, and everyone attending is equally eager to further advance the pest control industry. “PestWorld 2016 provided us with the opportunity to speak with installers and get feedback on the effectiveness of our products and suggestions for improvement. We value these opportunities to make improvements to our products. The great feedback we received about the Bird-X client experience was inspirational,” added Coughlin. Miller, a fellow Account Manager, believes Bird-X’s new laser device is another arrow in the quiver when it comes to bird control solutions. This was the first PestWorld event that showcased the new laser, and it gained a lot of interest among industry professionals. View all laser products here. When deterring birds, the key is to make them as uncomfortable as possible. This is done by attacking the key senses of a bird. The laser is another great addition to the Bird-X product line that disturbs a bird’s eye sight, disorients their flight path, and can be very bothersome in a night time roosting scenario. Laser technology for deterring birds is low-maintenance and sure to deliver a positive user experience. The Bird-X team is looking forward to 2017’s PestWorld, to be held in Baltimore, Maryland. Thank you for attending my “Talking Turkey About Bird Control” presentation at Pestworld. It was truly my hope to wake up the industry that structural bird control work is a lucrative opportunity, but one full of risks which must be assessed, planned for, and priced in to the jobs being done. Please feel free to reach out to me with any questions.